Learn the TRUTH about beauty and skincare. Most products are JUNK! The Skin Regime; Boot Camp for Beautiful Skin is an Amazon best-seller. The best-selling The Skin Regime: Boot Camp for Beautiful Skin is now in its 2nd expanded Edition. Dana will walk you through what is going to actually work with her direct viewpoints and great humor! Learn how to create a personalized regime based on dermatologists recommendations. Forward by Dr. David Bank. *PS he isn't afraid to tell the truth either! Learn what will truly transform your skin and make it gorgeous. Beauty magazines won't tell you the truth, they exist for advertisers. Models in the ads, yeah right! They probably don't even use the products they are modeling, and many are too young to even have a credit card to purchase them. Save time and money and learn the truth. If you like to get pampered with salon facials or doctor treatments--and it's working well for you--then keep enjoying yourself. But not everyone has that kind of money--or time. Learn about the "Challenge" to all the "big name" cosmetic companies. Do they even have the guts to try it? We doubt that. Bonus, 5% off book revenues are donated to worthy non-profit organizations by Dana. Visit TheSkinRegime.com and read the first chapter of the book for free! 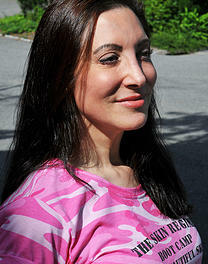 Dana Ramos has written non-fiction, fiction, and a screenplays. Another book, Basics of Everything, is also available on Amazon. She is a graduate of the USC Masters of Professional Writers program. Dr. David Bank (Foreword and technical advisor of The Skin Regime) is the founder and head of The Center for Dermatology, Cosmetic and Laser Surgery in Mount Kisco, New York. He has made it a personal goal to inform people about harmful skin care practices and fraudulent products and reveal how great skin can be accomplished with proper care and relatively inexpensive products. Listen to Dana talk a bit about her book and also the 1-4-All Peel. Make sure to check out the products created for Skin Regime. The 1-4-All Peel, Peel Preparation Solution and Gentle Cleansing Lotion and Advanced Care Moisturizer work hand in hand. Gentle and soothing. Watch Dana apply a Certified 30% Glycolic Acid Peel to The Tanning Mom.